Amplify your team’s productivity with Unified Communications and Collaboration (UC&C) solutions that make adding functionality both simple and cost-effective. Transform how your business communicates by integrating collaboration into the way you operate—to create a more agile, responsive workforce. 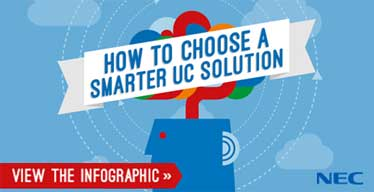 Our innovative UC applications deliver the tools that smart businesses need to increase performance. With NEC's UC solutions, you gain access to the latest productivity-enhancing communications applications, such as user presence, instant messaging (IM), whiteboarding, application sharing, a multimedia softphone, and your UC client. Empower today's anywhere workers with the tools to communicate and collaborate more productively. Optimize call management through a customizable, intuitive user interface. Advanced solutions for demanding customers.